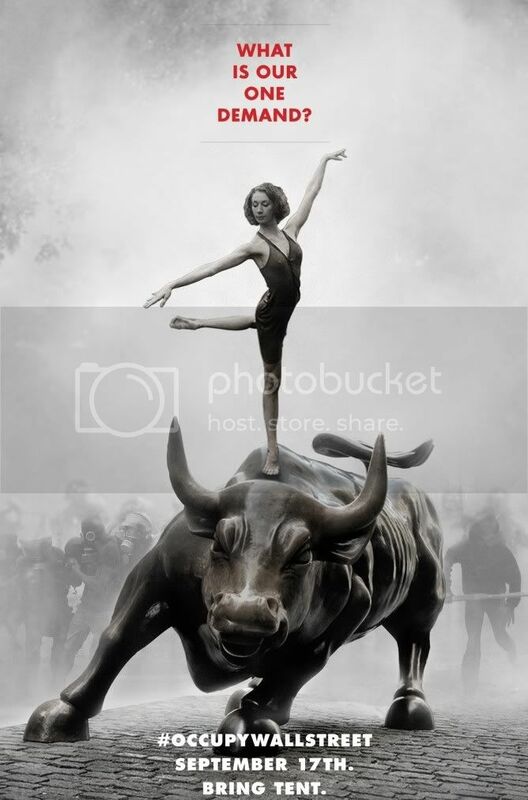 So what is ‘Occupy’ all about? A lot has been made in the mainstream media about the elusive “one demand” that Adbusters referred to in the original image that sparked the movement, and the ensuing lack of a single clear demand to fulfil that call. It is easy to see why ‘the 99%’ might have something to say to ‘the 1%’ (the spike on the right should actually continue upwards over ten thousand times as far as shown here, or more than a kilometre above your computer! ), and it also easy for us to let our brains boggle at numbers in the hundreds of billions of pounds. What can such numbers really mean? Yet Occupy has learned the hard way that they can become terribly real when we see some of the things that this virtually unlimited money is used for. For example, the New York Police Department, which has been increasingly violent in its treatment of OccupyWallSt, was given a $4.6m donation by bailed-out Wall Street megabank JP Morgan Chase, and the New York Stock Exchange and Wall Street corporations apparently now actually hire individual serving policemen for $37/hr. Such riches also permit the big financial institutions to appear generous by becoming the chief sponsors of organisations like St. Paul’s Cathedral. Not to mention of course that more than 99% of us work for money, which is apparently being magicked out of thin air by others, who then use this free resource to pay the rest of us to do whatever they see fit. Witnesses (AKA social reporters!) claim that one protester actually threw dollar bills at the police line while shouting “will you protect us now?” Incidentally, on the same day, on this side of the pond, Sky News were busy telling Occupy London campers that “what you’re doing is imposing your will on everybody else in a similar way (to the Nazis)”. Hm. Reasons abound for us to do our own reporting! Now, at first glance, all this confrontation might seem a world away from working diligently to improve the resilience of our local communities, but I believe that the links are strong, and I hope to see them grow even stronger. Let me explain why. 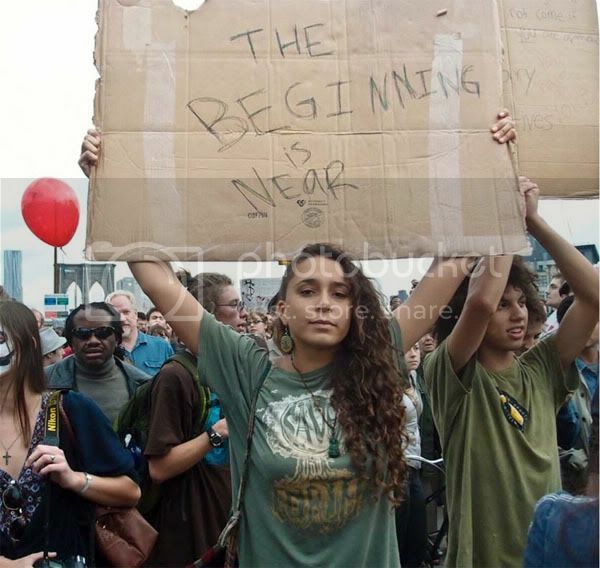 Both Transition and Occupy are founded on a belief that the current economic system is leading us to a future that none of us desire and, although peak oil seems to be a new term to many of those at OccupyLondon, we also share a strong strand of concern over climate change. The big question for OccupyLondon though is what next? 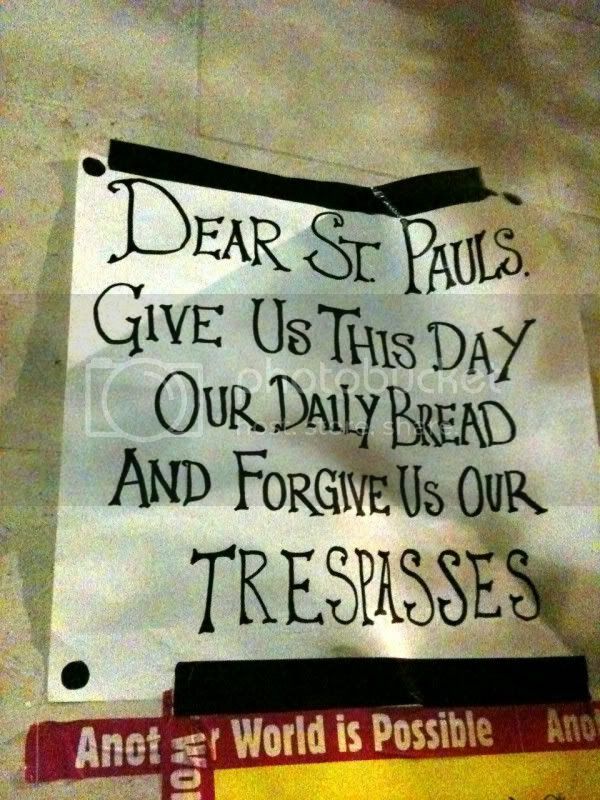 Substantial public support has helped resist the attempts of the Church of England and Corporation of London to have them moved on, and with St. Paul’s having conceded that the camp presents no reason for the Cathedral to close its doors, Occupy London has established a site, at least for now. But what to do with it? The mainstream media have been clamouring for a list of demands, yet I and many others find it refreshing that none has yet been forthcoming. I fear that setting demands is tantamount to saying “give us this much and then we will go home and allow the destruction that is business as usual to continue”. For example, there is growing momentum behind calls for Occupy to demand a ‘Robin Hood tax’. Yet as banks can and do create money it seems that demanding a fraction back might amount to selling ourselves for nothing. The first thing that I think Transitioners can usefully contribute to the discussions is an awareness of the energy limits that we are facing, and what they mean for the possibility of continued economic growth (even leaving aside the question of its desirability). 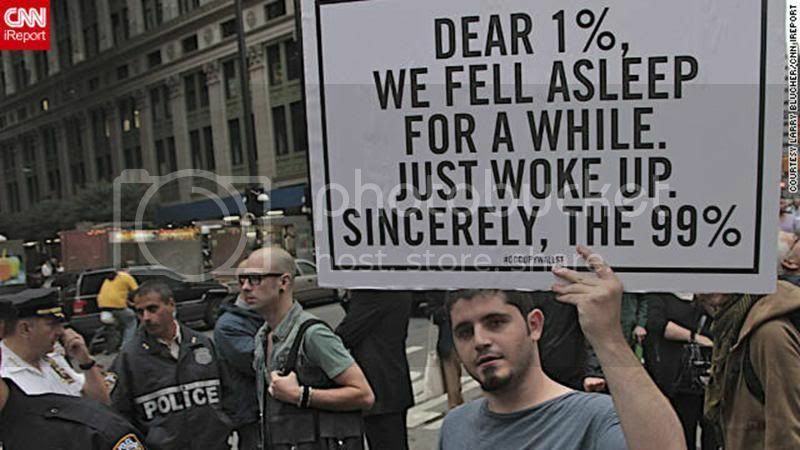 If Occupy became just a mass demand for the politicians to roll back the cuts and rescue those who have been abandoned, it might be set to fail, because the era of increasing energy abundance is over, whatever politicians might say or do. On the other hand, if Occupy recognises the inherent problem of protesting against the system your lifestyle depends upon, then the conversation goes to a much more interesting place – can we build alternative, independent systems to support us, even in a period of energy descent? This is where Transition’s five years of experience might be most helpful. So on that note, I hand over to the social reporters to explore this week’s topic of Transition economics. From local e-currencies to the gift economy – what can we bring to the discussion that is sweeping the world? 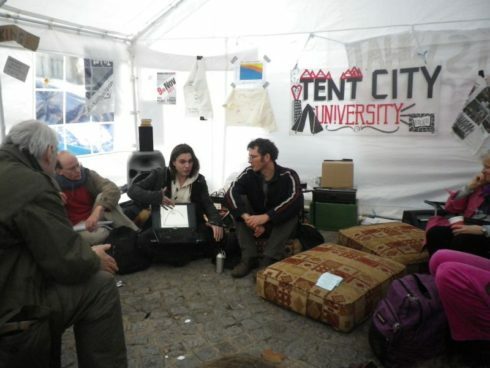 Edit – On Nov 9, Rob Hopkins and I did a joint presentation on Transition at OccupyLondon. Rob’s report, including an interview with me, can be found here. With no idea what they want, or how to achieve it? Ans financially I’m very much part of the 99%! !, but their attitudes and incoherence alienates me totally. But tents outside St Pauls… ? just a side show. Hi Barry, thanks for your thoughts. 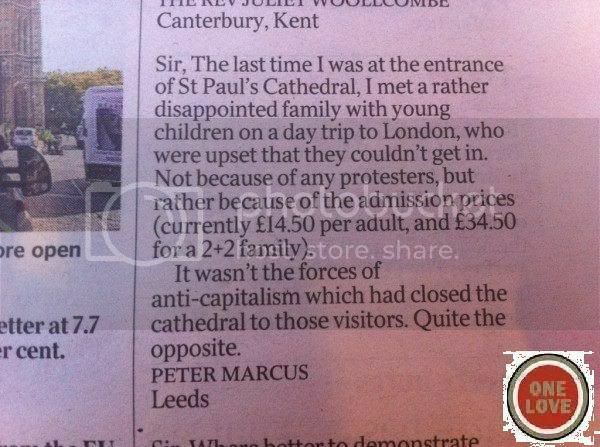 Actually, possibly the most impressive thing for me about OccupyLSX is that it isn’t in any way the ‘usual suspects’. Almost everyone I spoke to there had never done anything at all like this before (I should have mentioned that in my piece!). I think that may be a contributing factor to the prevalence of self-education on site – most of those present aren’t grizzled veterans with a long-held list of prepared ‘solutions’, but rather people who are keen to talk over their profound sense of disenfranchisement and try to understand better what’s really happening. 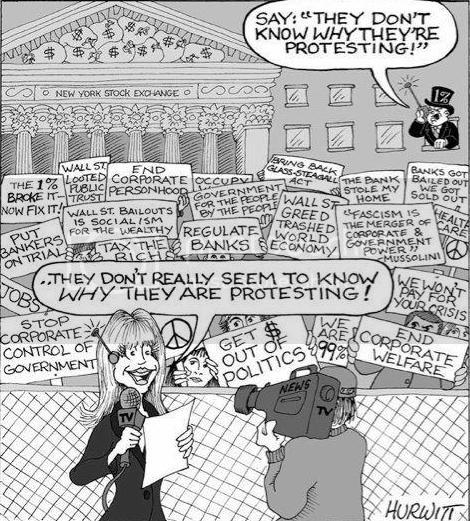 If you haven’t been down to your local Occupy, I strongly recommend it. Although I felt a bit lost when I first turned up, if you stick around for a General Assembly, or just chat to people to find what’s going on, it may prove as much of an eye-opener as it has been for me. Teach-ins to get more educated is exactly the right beginning, and should not really stop, but the holy grail is beckoning to identify some basic systemic infrastructure to change, possibly such as failure to shift taxing sufficiently from products of human effort (sales tax, income tax, improvements tax) to taxing land. Here in the US opposition is building against the legalized lie that corporations are persons. Good ideas abound on bank reform. Elizabeth Warren is our champion. Thanks Mary – yes, I heard that Los Angeles recently became the first major US city to vote against corporate personhood. That seems real progress. Over here, the Positive Money campaign is an important movement for an escape from debt-based money creation, and deserves widespread support and promotion.